Shot by Duffy for the mid-February issue of Vogue in 1961. 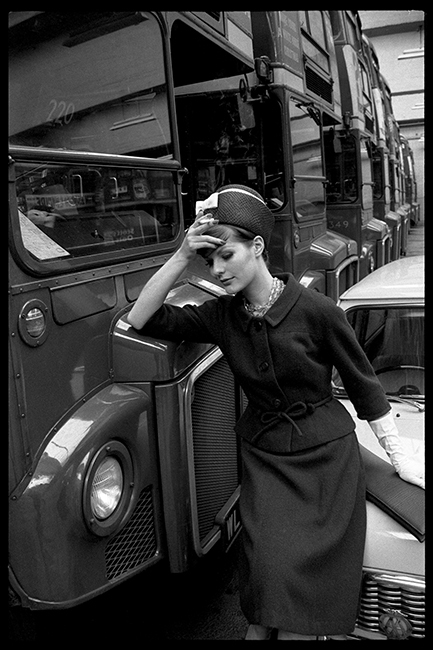 The model poses in front of an AEC Routemaster bus. The new vehicles were newly introduced in London in 1961 which replaced the iconic Trolleybusses that served the London Passenger Transport Area from the early 1930s. The article titled “More Than Your Money’s Worth” describes the “Maze of occupational hazards” associated with commuting. It also mentions the newly introduced Traffic Wardens “who wear navy uniforms, yellow bands and a tremendous air of authority.” 40 Traffic Wardens were deployed in central London in September 1960. They had the authority to ticket illegally parked cars with a fine of £2. The article was published in British Vogue mid-February 1961. Quote ref: E_445__01 if you require press information regarding this image.